Four British armoured divisions (1st, 7th, 8th and 10th) and one independent tank brigade (1st) fought in the Alamein battles. (There was a second independent armoured brigade (23rd), but since it was originally part of 8th Armoured Division, I elected to not treat it separately.) Two of the divisions fought on for the rest of the war and two disappeared from the Allied order of battle almost as soon as the battle ended. Much of the British Army's management of these armored formations had to do with its very disorganized approach to fielding them. When the battle began in late June 1942, two of the divisions were streaming back from the disaster at Mersa Matruh. The other two arrived as the battle developed over the next four months. Here we’ll examine the often confusing picture presented by the almost daily shifting of units within these formations and their movement to and from the front. The British defeat at Gazala was disastrous to the British armoured forces of the Desert Army. Every unit engaged was destroyed or so reduced in strength that it had to be amalgamated with other, similarly understrength, units when the battle ended and the retreat began. The more unfortunate were forced to surrender when Tobruk fell. First Tank Brigade was completely destroyed in the Gazala battles. Only the remnants of the 42nd RTR actually fought during the Alamein battles while the survivors of 42nd and 44th RTR manned the hastily-designed Scorpion (Matilda) flail tanks in mine clearing operations in support of the infantry divisions. First Armoured Division (2nd and 22nd Armoured Brigades and 201st Guards Motor Infantry Brigade) was broken into individual units and did not operate collectively at any time. During the battle 22nd Brigade was mauled by 21st Panzer Division. Second Brigade had some success against the 115th Motorized Regiment before losing two battalions to all three Axis armored divisions in the “Cauldron” fighting. By the 13th of June after more confused fighting, the division fielded only 50 tanks between the two armoured brigades. It survived the retreat to Egypt, but only barely, often acting as a rearguard. 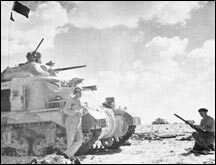 With almost all armored assets under its command, the 1st became the de facto tank headquarters of the Eighth Army in the Alamein line.With few exceptions, the first weeks of the fighting at Alamein were stories of missed opportunities and misunderstood orders. Following the failed attack on Ruweisat Ridge, the division was withdrawn for refit, not returning to the front until October battles. A different 1st Armoured Division returned. With 90 new Sherman tanks and 70 Crusaders, half of them armed with the six-pounder gun, the divisions’ single armored brigade (2nd) was a far more potent force than the British had fielded in the desert war before. With three battalions of artillery, one of them self-propelled, and the 7th Motor Brigade (reassigned from 7th Armoured Division), 1st was the equal in equipment and strength of the German panzer divisions. When the attack to break the Axis line turned into one of attrition instead, the 7th Motor Brigade won a pivotal and historic first in the desert war when the 2nd Battalion, the Rifle Brigade held the “Snipe” position against the Italian 133rd “Littorio” Armored Division and German 8th Panzer Regiment, the two Axis formations losing 35 tanks between them. For the first time the infantry of an armored division had defeated an Axis tank attack. In the battle for the breakout the division fought through the initial phases, but did not participate in the pursuit as it required refitting. 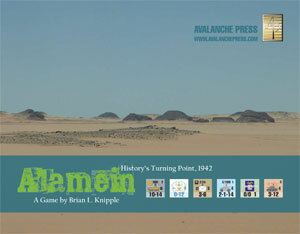 Join us on the road to Alamein. Seventh Division, the “Desert Rats,” began the Gazala battles commanding an armoured brigade (4th) and two motor brigades (7th and 3rd Indian) and had a second armoured brigade (1st) en route, making it the largest formation in the desert battle, maybe the desert war. All to no good, as the 1st Brigade was stripped of its tanks only two days after reaching the front in order to make up the already heavy losses in the frontline units, 3rd Indian Brigade was decimated on the first day of the battle and 4th Brigade suffered heavy losses. Only 7th Motor Brigade survived the battle intact, largely as a result of being positioned south of the fighting. After the crippling losses in armor suffered in the first two weeks of the fighting, it was decided that only a single armoured division headquarters at the front was necessary and 7th was sent into reserve where it was employed in only defensive operations during the Alamein battles until assigned as pursuit force when the Axis armies retreated. Eighth Armoured Division was formed in England in November 1940, and in April 1942 it set sail for the Middle East. One of the armoured brigades (24th) was delayed a month by engine failure in the convoy carrying it. Upon arrival, the 23rd Armoured Brigade and 8th Support Group were broken up and used independently and within two weeks of arrival were in action. Once again the inexperienced tankers were thrown against the Afrika Korps anti-tank guns and 93 tanks were lost. When 24th Brigade arrived it was stripped of men and machines to make good the losses in the 23rd. It had finally been realized that the Valentine tanks (with which the division was equipped) were best used in an infantry support role and the 23rd was taken from the division and made a separate brigade. The division was then re-organized to the latest type and the support group disbanded and replaced by the 133rd Infantry Brigade of the 44th Infantry Division. The understrength 24th Armoured Brigade was the single tank brigade under the new organization. Unfortunately the division was almost immediately disbanded with the headquarters becoming the training organization responsible for mineclearing in the upcoming offensive and the two brigades placed under 10th Armoured Division. In November 1941, 10th Armoured Division was formed from the cavalry regiments of the 1st Cavalry Division in Palestine and those units and equipment immediately available, which was not much. There the division lay all but dormant, its subunits understrength, especially in equipment and those formations brought in were continuously transferred back to the front as needed. The arrival of General Bernard Montgomery as commander, Eighth Army, saved the division from its idle existence when he decided that a third armoured division headquarters was needed to control the growing number of armored units. Suddenly the 10th was called forward, assigned an experienced divisional commander and given the 133rd Infantry Brigade. In the final Alamein battles, its only appearance on the World War Two stage, the 10th did not shine and it was dismembered in early November 1942 before being relegated to training duties and finally disbanded in mid-1944. American-built Grant tanks in British service, halted for maintenance in October 1942. In our Alamein game the British armoured divisions are not treated as other divisions in that their subordinate unit counters do not contain the divisional emblem. This is the result of the constant switching and replacement of units in the divisions. In game terms only the divisional headquarters counter contains the divisional emblem and all others units and even the leaders (yes, they were switched sometimes too) have none. Motor brigades were often infantry brigades temporarily reassigned from infantry divisions (examples include 161st Indian and 131st and 133rd British Brigades) and in fact the 44th Infantry Division was demobilized in November, 133rd Brigade remaining with 7th Armoured Division and the battalions of the other two being reassigned to Indian formations. The British practice of easily moving units from one formation to another make any attempt to define them in games terms pointless.